Toprak ana günü geliyor. 22 Nisan. Biz bugunde neler yapabiliriz? Yorumlarınzı bekliyoruz. 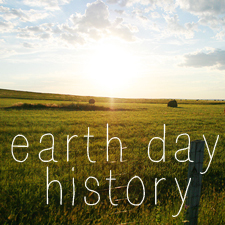 We wouldn’t be a green living site without sharing with you the Earth Day history, and how you can celebrate it in your own home. Earth Day falls on April 22 every year, and has since it began in 1970. John McConnell, a peace activist born in 1915 and passed away in October 2012, was a Christian man who believed that he had a religious obligation to care for the environment, and promote peace. In 1969 he proposed to the UNESCO Conference in San Francisco (UNESCO is the United Nations Educational, Scientific, and Cultural Organization which works to promote peace and security through those thee avenues in order to maintain justice and human rights) that a holiday be promoted to celebrate Earth and Nature, as well as the need to restore balance to damaged ecosystems. An incredibly inspiring man, Mr. McConnell’s passion grew from his awareness of early manufacturing pollution (from a plant he worked in) and set him far ahead of his time in terms of his environmental activism, as well as his work in peace activism. Although Mr. McConnell was created with bringing the idea for Earth day to UNESCO, Earth Day history also points to Senator Gaylord Nelson who established the first Earth Day on April 22, 1970. Nelson, a true grassroots advocate who actually preferred to make changed from the bottom up, was born in 1916 and passed away in 2005. Senator Nelson was also a huge advocate for consumers, and is credited for the start of side-effect disclosures for pharmaceutical drugs, and after his political career he remained an activist in environmentalism. Through his efforts in 1970, a reported 20 million+ participants were involved in Earth Day that year. With the involvement of colleges and universities around the country, with protests organized and different environmental groups being organized. It has continued to grow in a grassroots movement since, reaching reported numbers of over 500 million participants worldwide. For those of us too young to have been there, just imagine what that must have been like: passionate students and citizens, many working to protest wars, pesticides, pollution, social injustice…all suddenly coming together, realizing they had a common goal and seeing they were not only not alone in their efforts, but that 20 million other people were ready to come together in just a few months time to raise their voices. I can only imagine the amount of joy and hope each of these often frustrated activists (those usually looked over or shutdown, thought of as hippies or radicals) must have had to see crowds of people gathering under the same banner of an Earth Day celebration. For anyone who has ever been involved in activism, and who has ever been frustrated to get their message to a national stage, this can certainly be understood not only as a breakthrough in their efforts, but a reenergized sense of optimism. Many things have happened since that day in 1970, but I’ll let Wikipedia regale you with all those details. What’s more important is your OWN Earth Day history. Don’t get me wrong. Knowing what we came from is important to knowing where we’re going. But where we’re going is still the most crucial thing we need to look at. And the largest part of where we’re going has to do with what we’re modeling for our children. Look at your own Earth Day history: Has it been a day to only participate in Earth Day activities or throw together some Earth Day crafts? Or has it been something you’ve carried throughout your year, instilling your values in every choice you make. Protests, demonstrations, teach-ins, crafts, activities, talks, conventions, or other events are good for celebrating and good for sharing, but the real value is in what we demonstrate when were not on stage. Examining our consumer choices, voting with our forks and our dollars, making a statement by what we won’t be a part in throughout the year…these things matter the most. It’s the small day-to-day choices you make that exemplify a way of life to children that can become natural and second nature. When your entire life is about healthy food, simply living, natural health, and aligning your choices with your values (especially your values in your relationships), Earth Day only becomes a token of what we do year-round. Our children grow to take environmentalism as a given, ensuring they simply won’t stand for the degradation of our ecosystems and the animals within it.